Finding toy storage organizers can be tricky as there are so many options available. Well, to prevent you from feeling overwhelmed, we’ve researched and reviewed the best options that are currently available. All you need to do is have a quick read below to learn more. A buying guide section is also available at the end to provide you with further information. 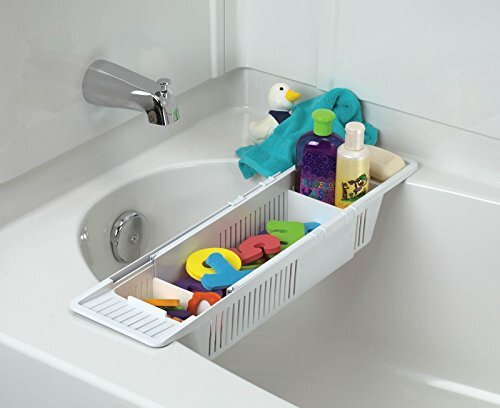 The KidCo Bath Toy Organizer Storage Basket is available in a white color, which can make it a great addition to your bathroom. We liked how it comes with an adjustable feature as it allows you to customize how you want to store your things. There are also divider panels available which can be moved around and fitted wherever you like. This is an awesome way to make organizing a bunch of different items a lot easier. So, you can easily separate your child’s bath toys from the shampoos and soaps. There are slotted sides available which ensure all of the items inside are able to dry properly. We liked how this one comes with an adjustable feature as it allows you to organize your things exactly how you like. 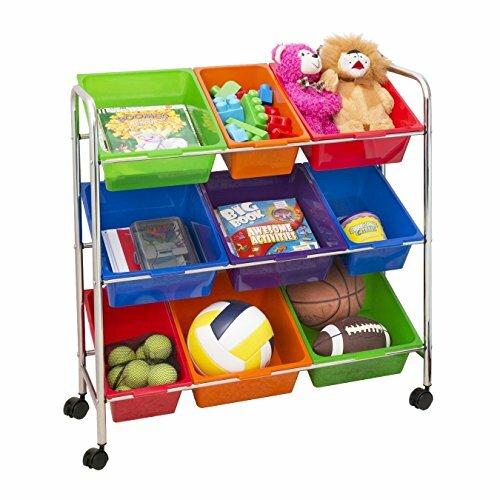 The Seville Classics Mobile Toy Storage Organizer comes with a total of 9 bins available. As a result, you’re left with plenty of space to store all of your children’s items without any hassle. We liked how these bins are available in a range of colors, which include green, blue, red, purple, and more. This makes it a great addition to your child’s bedroom as they find the variety of colors more exciting. As a result, this could also be an effective way to boost your child’s color recognition skills. We were impressed with how there are casters available on the bottom of this storage container as well. It allows you to move it around the home with ease. This is a great option if you’re looking for something that you can wheel around the home to pick up and store items. The Tot Tutors Kids’s Toy Storage Organizer comes with a total of 12 bins that are made out of plastic materials. These can be easily removed and put back in place as you please. There are 8 standard sized and 4 larger bins available. Therefore, you have the space available to store both the small and larger items without any issues. Parents have been liking how this one is super easy to assemble. It has also been constructed out of high-quality wooden materials. Therefore, you can expect it to last you for years. It’s available in a range of different colors to ensure that it fits perfectly in the room where you want to keep it. We liked how there is a wide range of bins available as it ensures that you have plenty of storage space available for all of your child’s items. 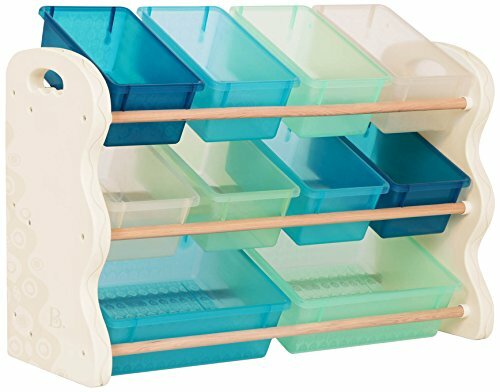 This Plastic Toy Organizer by Delta comes with a total of 9 bins available. As a result, you’re able to use it to store a wide variety of your children’s items without any hassle. These bins are available in various sizes. So, you’re able to store your children’s smaller items in the smaller bins, and their larger toys in the bins that have more space. We liked how they’ve put a lot of attention into ensuring that the frame is constructed out of high grade wooden materials. This ensures that the organizer will last you for years of use. The wooden design also means that this one looks great in rooms around the home. This is an awesome storage organizer that has a durable wooden construction which ensures that it will last you for years of use. 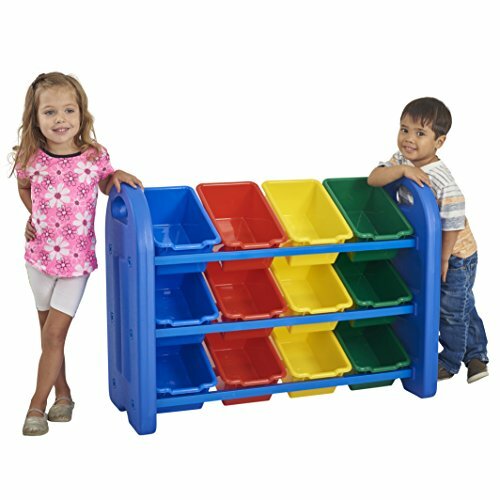 The Tot Tutors Discover Collection Supersized Storage Organizer can been made using high-quality wooden materials. As a result, you can feel confident in knowing that you’ll be able to use it for years. These materials are also easy to clean, which makes the maintenance a breeze. Parents have also been glad to find that assembling this one is easy too. We liked how the bins that are available can easily be removed and put back. This allows you to walk around and put your children’s items inside the bins to make the clean-up after playtime easier. Furthermore, the size of these bins are larger than regular organizers. 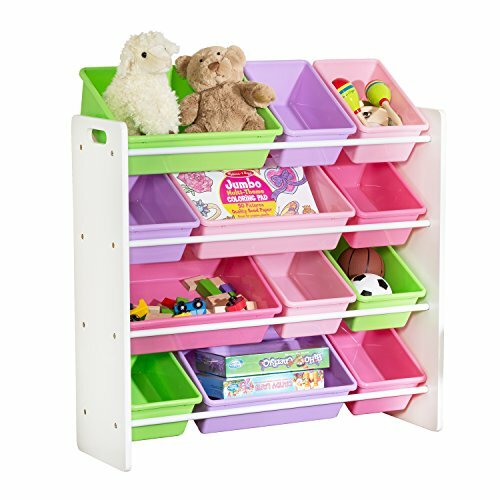 So, you’ll have no hassle when it comes to using this organizer to store all of your children’s toys. Parents have been liking how they’re able to organize and easily clear up all of their children’s toys with ease due to the removable and larger sized bins. The ECR4Kids Toy Storage Organizer comes with an impressive total of 12 bins. This allows you to have plenty of space to store all of your child’s items without any issues. We also liked how they’ve used a 3-tier design. 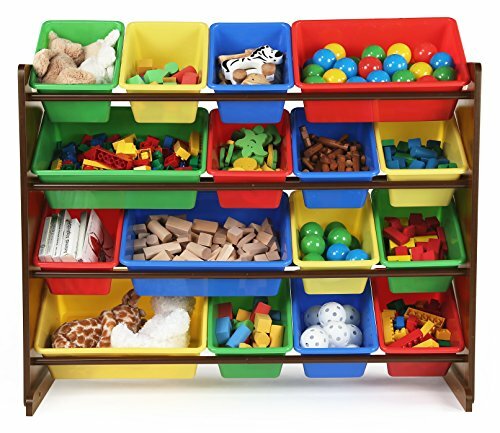 This allows you to organize the toys and items in the bins according to their rows. Moreover, there’s a lightweight design to the organizer, as well as handles available. As a result, you can easily move it around your home. They’ve used a rounded edge design on this one too. 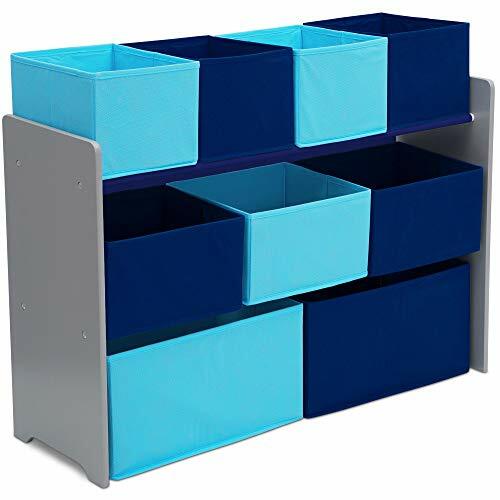 Therefore, you can be sure that your kids will be safe while at home around this organizer. With 3-tiers available, you’re able to organize your children’s items in rows. You can also easily move it around to different rooms as a result of the lightweight design and handles. This Delta Children Multi-Bin Toy Organizer has an awesome Disney Frozen theme. This makes it the perfect addition to your child’s room if they’re a fan of the movie. It has been constructed using engineered and high-quality wooden materials. Therefore, you can feel confident in knowing that it will last your child for years. There are six bins available which provides you with plenty of space to store and organize your children’s items. Furthermore, due to the design of this one, we found that kids feel encouraged to clean up their own items too. The height of this one makes it ideal for kids to use, even if you’re not in the room. The Disney Frozen design of this toy organizer is awesome for encouraging children to tidy away their own items. 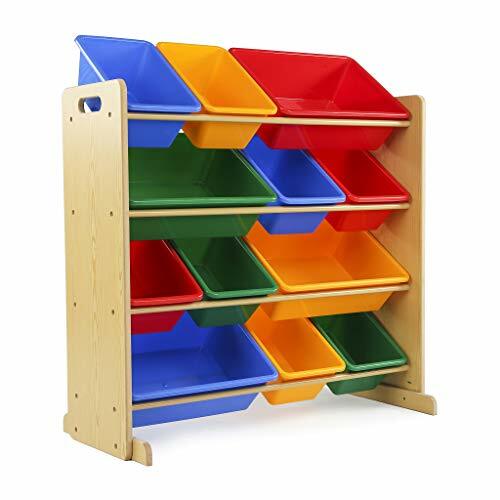 The B. spaces by Battat Tidy Toy Organizer features a range of 10 bins and a storage bin rack. We liked how all of these bins can be moved and stacked in any way that you like. Therefore, you’re given the freedom to organize your children’s toys however you like. There are also 2 different bin sizes available. As a result, you can store the smaller items in one type of bin, and the larger items in the bigger bins. The design of this organizer is also fantastic as it looks great due to the ivory colors that have been used. Parents have also been glad to find that assembling this organizer is super easy. Not to mention, the materials used to construct it are of a high-quality, which ensures that you can use it for years to come. 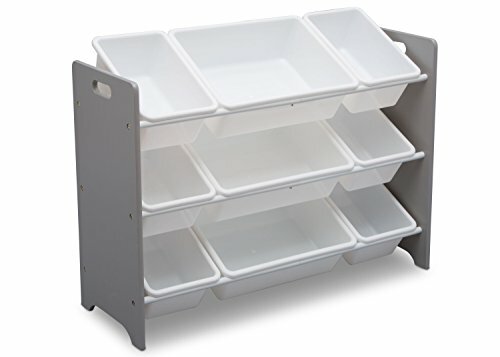 What makes this storage container stand out? The durable materials available with this one mean you can use it for years. Furthermore, the assembly is a breeze! 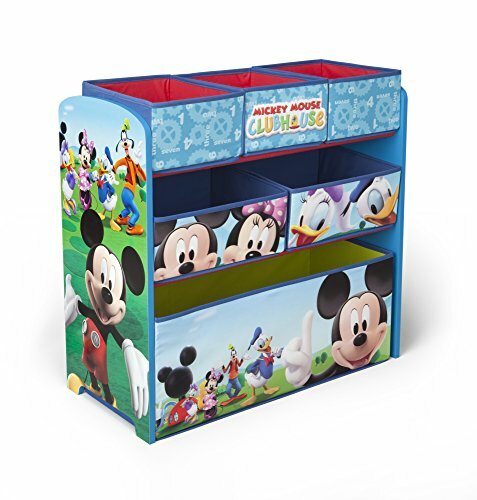 This Children Mickey Mouse Clubhouse Multi Bin by Delta features an excellent Disney theme. This is a fantastic way to encourage your little one to help out more often when it comes to tidying up their toys and keeping them organized. The height of this organizer is also perfect for kids to use easily too. We liked how there are 6 storage bins available as it provides you with plenty of room to store away your children’s toys. These bins have also been designed with fabricated materials to ensure that they’re safe for kids. In addition to this, the frame of the organizer has been constructed using high-quality wooden materials. Therefore, you can use it to store your children’s items for years to come. 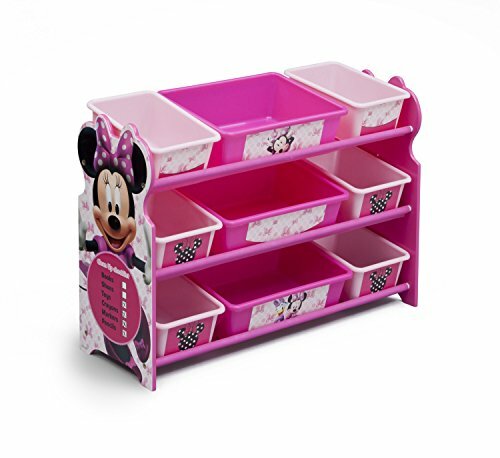 The Disney design of this organizer, and the height, makes it awesome for encouraging kids to help out and tidy away their toys. Delta’s Children Bin Plastic Organizer comes with an exciting Disney Minnie Mouse design. As a result, you can expect kids to help when it comes to tidying away their toys more often. With 9 bins available, you can feel confident in knowing that there is a lot of room for you and your child to store away all of their toys without any issues. The assembly of this one is also pretty straightforward. So, you can have it set up and ready to use in no time. We liked how it’s easy to maintain as you can simply wipe it down to keep it clean. The engineered wooden materials that have been used to construct this one are very strong. As a result, you can expect it to remain durable for years ahead. This is an awesome choice for kids who are fans of Minnie Mouse. The design that’s available with this one encourages kids to tidy up their toys. 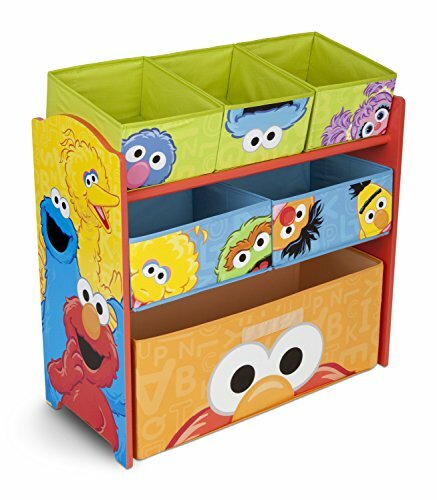 This Toy Organizer has a fun Sesame Street design, which makes it an excellent option if your child is a fan of those characters. It’s an effective way to encourage children to tidy away their toys after they’ve finished playing. The height of the organizer is perfect for younger kids as well. So, they can easily reach in to grab toys and put them back in. We liked how the assembly process with this one is easy. Therefore, you can expect to have it all set up and ready to use in no time. Furthermore, the engineered wooden materials that have been used to construct the frame are of a high-quality. This ensures that the organizer will last as your kid grows up and could even be used for then next one if you have a young son or daughter. This is an awesome toy organizer that has a fun design that’s effective at encouraging kids to tidy up their toys. The Honey-Can-Do Kids Toy Organizer comes with a total of 12 containers. As a result, you have plenty of space to store all of your children’s toys and items. We liked how these containers are available in different sizes. It provides you with the ability to store specific items in certain bins according to their size. Furthermore, we also liked how the bins are brightly colored. This can help you to sort how you want to store things. It’s also great for helping develop your child’s color recognition skills. The wooden materials used to construct this toy organizer are of a high-quality which ensures that it will last you for years of use. Moreover, it has materials that are resistant to stains and it can easily be cleaned. This is an awesome choice for organizing how you store your children’s items according to the colors of the bins. The varying sizes also allow you to customize how you want to store things. Delta’s Deluxe Multi-Bin Toy Organizer comes with a range of 9 bins, which provided you with plenty of storage space. They are also available in a range of sizes, which include 2 large, 3 medium, and 4 small bins. As a result, you can store various toys and items in the corresponding bins that suit the size of the items the best. Parents have been liking how the assembly of this one is super easy. Therefore, you can have it all assembled and ready to use in no time. The wooden materials use for the construction are also of a high grade, which means you can expect them to last for a long time to come. The different sizes of the bins make it easier to organize and store away your children’s items. Now that you know more about what the top storage containers have to offer, you can begin to think about the one that you think would suit your home the best. If you’re still not feeling completely sure on which one to go for, don’t worry. We’ve created this buying guide to help you figure out the one that’s best for you and your needs. To learn more, take a look below. After reading through this review, you will have seen that there are a number of different kinds of toy storage bins available. To discover more about these different types and what makes them different from one another, you’ll want to read through this section. There are kids toy storage containers available that can also be used as furniture. For example, some brands manufactures storage containers that can also be used as a bench. The lid shuts down and kids are able to sit down on it, which creates an additional seating area in their rooms. In other instances, there are trunks, and shelves available with the container too. So, you could be getting more than just something to store your children’s toys away. 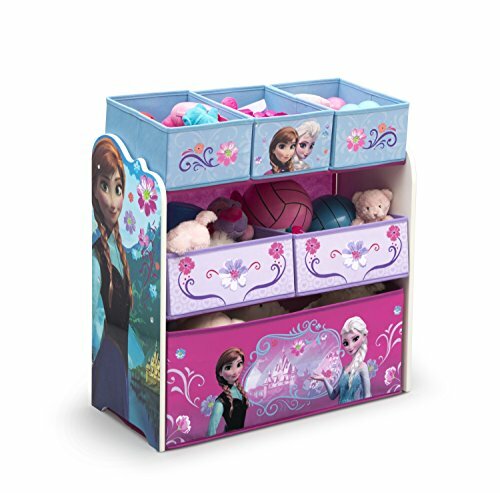 The toy boxes and chests that are available tend to be among the large toy storage units that are available. They have lids which can be opened and closed easily and are great for fitting in a lot of items. Depending on the one that you choose, you’ll find that some come with dividers available. These are helpful when it comes to organizing your children’s different toys and items. However, if you’re just using it for a bunch of toys, a chest that doesn’t come with divider panels may work well too. The bin organizers that we’ve reviewed in this post are a great way for you to organize your children’s items, you can also use them to teach your child organization skills. There are various options that feature bins in a variety of sizes that range from small to large. This provides you with a great opportunity to store toys away according to their size. Moreover, you can find bins that come in bright colors, which makes it more exciting for kids to use. These types of bins are also excellent for improving your child’s color recognition skills. You may also want to consider the bins that can be easily removed and put back. They enable you to walk around and pick up your children’s toys to make the clean up process a lot easier. Containers are pretty similar to the bins, except that they are generally larger. Therefore, you’re able to use them to store a wider range of toys that are bigger in size. When it comes to choosing the best children’s toy storage units that are available, you’ll want to consider the color. This will highly depend on the room that you want to put the storage container in. As you can imagine, there are a lot of benefits that you and your child can experience when it comes to using a toy bin. To learn a little more about what these benefits are, you’ll want to take a look at the section below. The number one benefit to having a bin organizer in your home is that it enables you to keep the rooms tidy, with ease. This is especially the case with the options that have fun themes on them as they help children to have fun cleaning up their toys. So, if you’ve been struggling with playroom storage, the choices mentioned in this review could be perfect. There are various organizers that can be used for tidying away your children’s toys that also come with additional benefits. For example, the options that double as a mini bench can be a great way to add some more seating spaces in a room for kids. The storage organizers that feature shelves are another great multipurpose option that allow you to store away books, as well as toys, all in one place. If you were having a hard time coming up with ideas to keep your home tidy, we hope that you’ve found a solution in this guide. Regardless of whether you’re buying for a son, daughter, niece, or nephew, everything you need to know about the best toy storage organizers can be found, right here!